edited: This lovely give away is now closed. 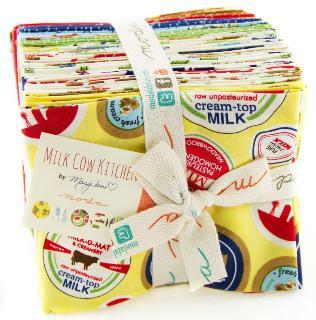 Today Green Fairy Quilts is generously sponsoring a give away of a Fat Quarter Bundle of the newly released line Milk Cow Kitchen by Mary Jane for Moda. 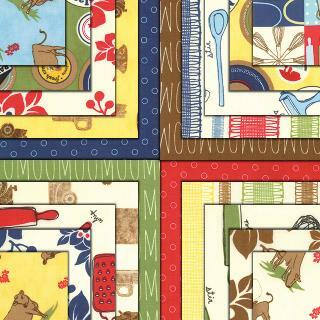 I'm going to show you some of the prints in this very retro bundle that reminds me of my grandmother's kitchen while I tell you a bit about this lovely on-line quilt shop. Green Fairy Quilts is a family run business by Judi and Clint Madsen. 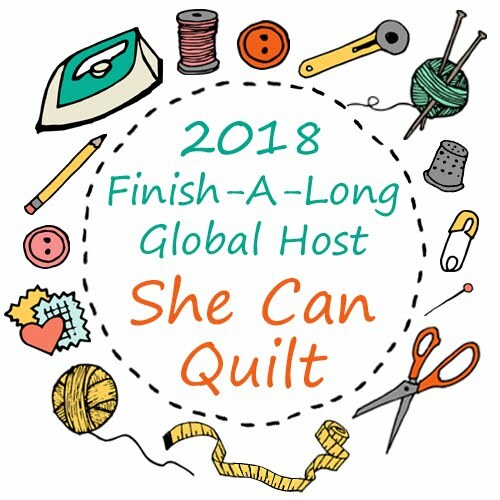 Judi Madsen is an extraordinary award winning long arm quilter who teaches, has designed beautiful patterns and has a book out - Quilting Wide Open Spaces - that I consult often when I am quilting. Judi shares her quilting on her beautiful blog Green Fairy Quilts. 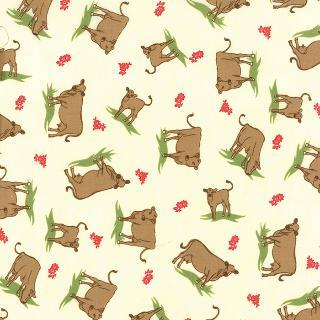 Yes, there are cows in this bundle. At the Green Fairy Quilt shop, Clint does most of the leg work, now assisted by Judi's sister. Clint is lovely to work with - if you email him a question, day or night, chances are that an answer will pop up within a few minutes. Green Fairy Quilts focuses on pre-cut fabric bundles, and select yardage, which they make available at excellent prices. They also have sales and feature a Monday special, which you can find out about by signing up for their newsletter here. Look, retro milk bottle caps. Clint and Judi also do active ongoing charity work for children in Romania, and have a registered charity to support that work. Their next trip to Romania is scheduled for this fall. This print is just plain cute. Green Fairy Quilts also a large selection of notions, including a huge range of the Aurifil Thread Collections - seriously, I think they have most every collection I have seen lately - and Superior Threads So Fine cones at great prices. They even carry my favourite Gingher Rotary Cutter, which, being metal, has a lovely weight to it, in both regular and left handed varieties. You can also find some yardage, batting and patterns in this shop. This is my favourite print in the line. 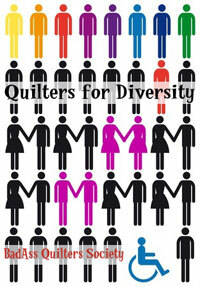 It would be so perfect for the back of a quilt for a guy. Green Fairy Quilts offers reduced pricing on most every product in their store. They have free shipping in the USA and discounted shipping to the rest of the world. 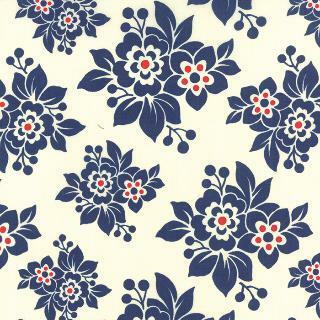 This floral is also so retro and would look great as a border or a back. Green Fairy Quilts is carrying this one as yardage too. To enter the randomly selected draw, go and have a look at the Green Fairy Quilts selection of fabric, thread, and other items and come back and leave one comment letting me know what you especially like in their shop. If you are an old or new follower of my blog or me in some way, you can leave a second comment telling me how you follow me. I will close the draw on Thursday, August 14, 2014 around supper time at my house, use the random number generator to pick one of the comments, and announce the winner then. Good luck and although I do try to reply to comments on my blog, I am usually not able to do so for give aways. A large number of folks who have entered draws here lately do not have an email attached to their profiles. Make sure you do or leave me a way to find you in your comment (blog address, instagram name, email, whatever you like). If I have no trail to find you I will draw again. Finally, Green Fairy Quilts have sponsored this give away and they sponsor my blog, but they did not ask or require me to write a single nice thing about them in doing so. I choose to shop at this store regularly, and the opinions expressed here are my own. I would really like to get my hands on some Miss Kate! I have been wanting some Lexington by Minnick and Simpson. Love the Boo Crew FQ bundle! I've had my eye on One for You and One For Me because the colours and prints are so sweet! I love that cow print too!!! Thanks for the chance! I follow your blog via Bloglovin'!!! Thanks for an extra chance!! I love the Fat Eighth bundle, La Fete de Noel by Moda -- great muted Christmas colors! I follow you with feedly! Love the GF shop! They have great prices and I love the free shipping! The fabrics I'm drooling over the most from their selection right now is Figures by Zen Chic. I'm on a bit of a Zen Chic kick lately. Thanks for the chance to win! They are a fantastic shop and I love love love the the African selection of Aurifil in 40 weight. I love 40 weight. I am a GFC follower. Hope you had a nice Monday. I love GF shop and I love Timber Trail Flannel! I love all the batiks, especially the Catalina, Color Crush, and Make Waves FQ bundles! I love the Milk Cow Kitchen the best since I was raised on a dairy farm. Miss Kate is my favorite right now! I follow through Bloglovin..love the update emails! I would really like to purchase some Moda Be Jolly. Thanks! I love Green Fairy Quilts because they run some great sales throughout the year, and their customer service is awesome! I love the MIss Kate line, but this bundle you're featuring is pretty darn cute! I am anxiously awaiting Kate Spain's new collection Horizon. I just received one of their daily deals of Daydreams in the mail today. I love the new line by Bonnie and Camille, Miss Kate. I love Forest Friends and Miss Kate right now but this selection is also adorable. I love Green Fairy Quilts as they have so many great sales and free shipping. Love Green Fairy Quilts - all the wonderful Moda precuts! Love Judi's book also and have used her CD templates several times. Thanks for the fun! I really like the quilt kit-Moda Quilt Kit_Giggles. I also have never done a jelly roll quilt and have really wanting to...I like the Moonlight Manor Jelly Roll! I especially like One for You and One For Me. I love In to the woods very much! But there are great other bundles. I am a follower of your blog with bloglovin'. Miss Kate is on my list. I follow you through my blog reader. I love the solids of Grunge but I have had my eye on the Hex N More Ruler. Great price. I also love the giveaway fabrics - way too cute. I'd love to have Figures by Zen Chic, a Charm Pack would be nice, a FQ bundle would be fabulous. Thanks for the chance! I have shopped with Green Fairies before.......I need one of those hex n more rulers and I always find fq bundles I love.....love the Grunge, Forest Friends,Mochi Dots, Storybook Brushed, Sewing Box, the Milk Cow is adorable!!! Love the red and the green kitchen print. I'd choose Miss Kate! so yummy! Thanks a lot for the chance. I enjoy shopping at Green Fairy. Good prices, great/quick shipping and Pre Orders. Thank You for the chance to have the cows come home to my house. Thanks for the introduction. I'm loving the bundle of Linen Mochi Dot by Momo, it's going on my birthday list right now! I like Elementary and Miss Kate, but they have a lot more that I would love to get. Thanks for the giveaway. I really like a lot of it!!! How to choose??? 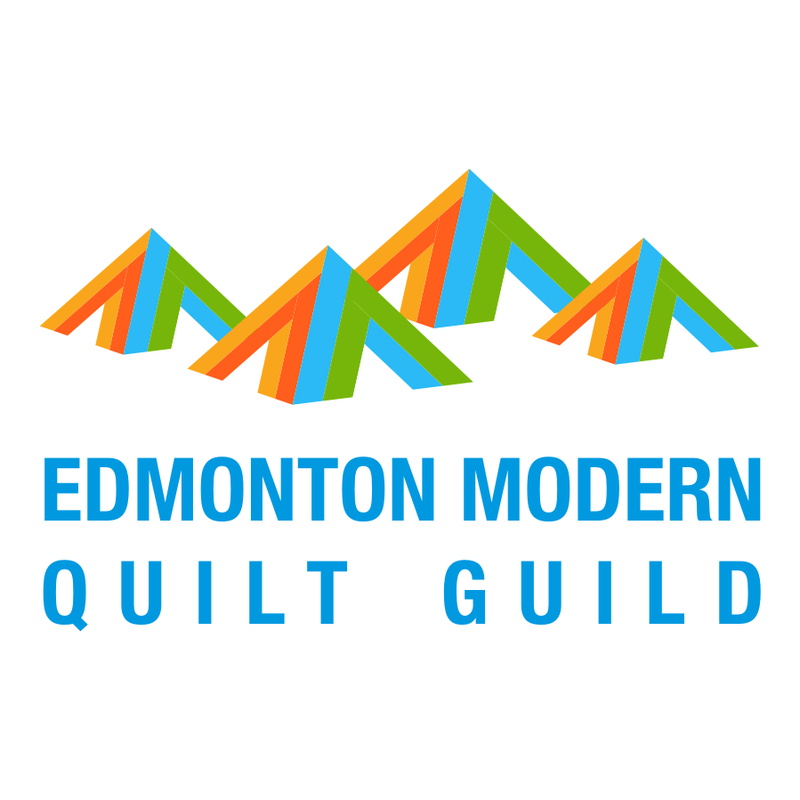 Ok, I narrowed it down to Moda Fat Quarter Bundle - Castlewood by Jan Patek. Beautiful! I have been receiving your e-mail newsletter for awhile. I am on a fabric diet but a bundle of Moda Grunge would be fabulous as a blender to use up some of my stash! I think I need one of Sara's Big City Aurifil collections, beautiful. I follow you via email. love your blog! mburnette912@bellsouth.net I also follow Green Fairy Quilts! Riley Blake chevron or dots! So cute! I love Elementary by Sweetwater, and would love a layer cake of it. I am loving Riley Blakes -Home for the Holidays line! thanks! I follow your blog w / GFC . thank you! Green Fairy carries Bella solids, which have a lovely hand, and they're on sale right now! I am a regular reader, by way of feedly. I really like that they have such a big selection of pre-cuts and that it's all sorted by type, so if you're just looking for one kind you don't have to wade through everything else. I really like the selection of solids. I know they've been working on growing this part of their shop. Grunge! Wait! I like Elementary. No, it's Figures! Honestly, these three are all equally my favorites. :-) Thank you for a chance to win. I like that you can order pre-release fabric, so you never miss out and I'm glad now they are increasing their notions. I've be buying from Judi for a few years now. Thanks for the chance to win. I love the rotary cutter... I didn't even know there were metal ones! I think I'm in love with the Aurifil collection Happy Colors by Lori Holt. The shop really does carry a great selection of Aurifil collections. Thanks for the chance to win. 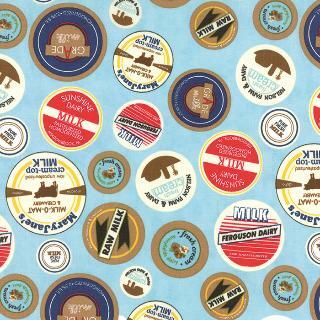 I especially like the Miss Kate fabrics. I like a lot of items....Figures, Elementary. I love the wonderful collections of Aurifil threads and the tutorials. Green Fairy Quilts was one of the first blogs I followed. I love drooling over the forthcoming collections which they promote. I really like Elementary by Sweetwater. Any precut of Miss Kate would just tickle me pink! I love everything about their business. They are sweet. I'd love some Miss Kate. I just love Sweetwater's new line, Elementary. I love Into the Woods and Miss Kate. I regularly shop at Clint and Judi's and they are soooo fast to ship. An awesome on-line shop!! Looove so many of the things in their shop...but am so "addicted" to Sewing Box!! Would get the Fat Quarter bundle. I am a big fan of Zen Chic's Figures. I love the cows and milk. My Dad used to have cows and deliver milk so it brings back fond memories. I go to Green Fairy for the Jelly Roll selection. I could use some Grunge right now. I'm an old Bloglovin' follower! 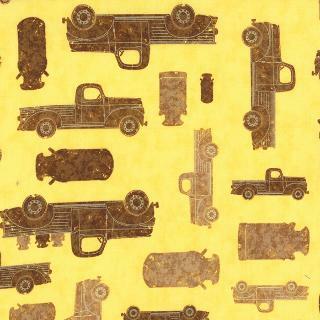 I've been drooling over the Giggles quilt kit they have and all of the jelly rolls! Thanks so much for the giveaway! I'm in love with Figures by Zen Chic! I follow you by email! Thanks so much! I actually want this bundle, I looked out for it at Festival this weekend but no one had it yet. It's a bit different to the usual lines. I follow you on Bloiglovin! Oh I like so many but love the sewing box and love the cows in the above bundle too. Thanks for the chance to win. I've included your giveaway in my giveaway roundup at wowIlikethat.com too. Hopefully you get lots of entries. Thanks again. Love the Moda Posy Ditsy Geranium! I love Posy Story Foxglove, a great text print! I have JUST discovered Aurifil (I only own 2 spools) and am hooked for life! I absolutely ADORE her selection of Aurifil. Now to save up my pennies! Thanks for the chance to win! I love their site. The free shipping is a great feature. I love their selection of fabric! So hard to choose just one! Love the vintage delivery trucks. Thanks for the giveaway. I would love to get my hands on Lexington by Minick and Simpson. I'm not usually a blue girl, but that line is gorgeous! Hard to choose just one but the Lexington line is beautiful. I'm a little partial to blues. I really like Folk Art Holiday! Making some Christmas quilts! I love all the precuts, but mostly I loved reading about their charity work! I have shopped at green fairy quilts and their service is great. It was lovely to learn more about them! I would like to get my hands on some figures by zen chic, love her fabrics! Thanks for the giveaway. I love Green Fairy Quilts! Oh my goodness and that farm fabric- we live in the country and that would be PERFECT for our house! I think I'd get some of the Lexington line from their shop. I have a two year+ WIP that uses those colours! I love the Miss Kate line. Thanks for the giveaway! 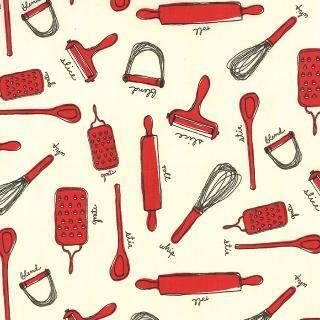 That kitchen utensils print is too cute. I have still not purchased any Grunge(! ), and am impressed with the prices and FREE shipping at Green Fairy. Pretty tempting!! I have ordered from Green Fairy before. great service. I like the new threads she is carrying. Miss Kate is such a fun line. The Moda autumn woods yardage is really pretty. This line is adorable! I love the rolling pins. I have made several bulk charm pack purchases from Green Fairy as giveaways for my retreats. You can't beat their flash sales! I follow you all over the place! I like the large selection of books they carry. I like Green Fairy's Make Waves batiks and Miss Kate flannels. Free Shipping is an added plus. I know Green Fairy Quilts. Judi is one of my most favourite quilters! Thanks for the chance to win. I just spotted Elementary, I seem to be in a 'blue' mood! Oh I want one of those rotary cutters!! It really looks like a serious tool. I'm loving those bottle caps! If I could have Green Fairy grant my wish it would be their Moda Fat Eighth Bundle - Lexington by Minick & Simpson. Love it!!!! 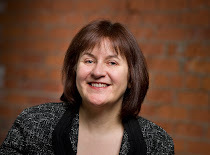 I have enjoyed following your blog for several months now! I like Figures by Zen Chic. Thanks for the giveaway!